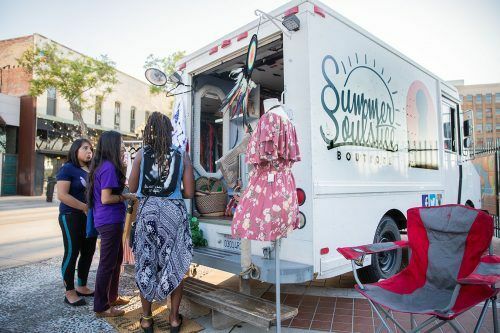 Among the various artists who participated in the Pomona Art Walk Saturday was the Summer Soulstice Boutique, a mobile clothing boutique run by Baseemah Penna of Azusa. The monthly Art Walk is from 6 p.m. to 9 p.m. the second Saturday of every month in the Pomona Arts Colony in downtown Pomona. Photographer Angeline Herron showcased what she called her most valuable work Saturday at the Pomona Art Walk. Herron began taking photographs at a young age when she started playing with her father’s camera from the Vietnam War, she said. It took her many years to decide that photography was going to be what she wanted to do for a living. Every second Saturday of the month, Pomona hosts an art walk in the Pomona Arts Colony. The event features an array of different artists showcasing their own work, from photography to live musical performances. It gives individuals all across the community a chance to showcase what they are passionate about, while providing community members a possible learning experience. Herron said she sometimes struggles to recognize her own artistic value, and realizing that she is indeed an actual artist. Not everyone featured in the art walk fell into photography as young as Herron did. Sharif Shakhshir told a different story about his art. He began writing as a young boy and was intrigued with creating worlds where anything could happen, he said. Shakhshir became interested in photography after taking a class in college and decided to continue the hobby when he realized that cameras were hackable. He realized that his two passions could come together as one when he began to write extensive descriptions about the photos he shot. “I try to use my writing to bring more meaning into my photos,” Shakhshir said. To keep it local, Kiara Delgado captures pictures of downtown Pomona in her free time. She is inspired by the vintage look throughout Pomona, capturing all of her images solely in black and white, she said. One of the most important qualities to being an artist is to have patience and to be comfortable with one’s own art, she said. Delgado’s local art allows her to venture out on her own and to rediscover her own city. In the future, she hopes to have her photographs in galleries, she said. Ekaterina Orlovie showcased her art that she has turned into postcards, buttons, wall posters and a mini-book. Her art was different from the rest because it was drawn, rather than photographed. Orlovie makes prints of her drawings which include subjects such as pretzels, donuts, tangerines, witches, monsters, and other magical creatures so she can sell them. On one print she added a holographic design to make the drawing stand out and have a magical effect, she explained. The Pomona Art Walk is a place that allows creativity to flow through multiple booths, live music, vendors selling hand-made crafts and artists revealing their talents. The environment was welcoming to the entire community with activities including food trucks and live music. Pomona becomes alive every second Saturday of the month with a range of different vibes and personalities all coming together to support the art and artists within the community.